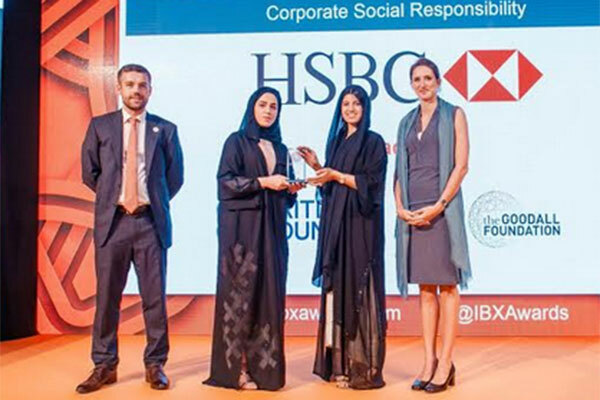 Taqaddam, the British Council and HSBC’s life skills programme for 15-16 year olds in the Mena region, has been awarded runner up at the International Business Excellence Awards in the corporate social responsibility category. Gemma Barlow, British Council Head of Programmes, UAE, received the award on behalf of the British Council and HSBC at a ceremony in Dubai’s Jumeirah Beach Hotel. Now in its fourth edition, the International Business Excellence Awards recognise and celebrate workplace best practice from across the world. Taqaddam was one of eight initiatives shortlisted in the CSR category, the most competitive of the 35 categories in this year’s awards programme. Taqaddam, which means ‘move forward’ in Arabic, equips students with a robust set of transferable life skills needed to be effective global citizens. The programme was developed by HSBC Middle East in partnership with the British Council and incorporates content prepared by The Goodall Foundation. In the three years since Taqaddam was launched, it has attracted the participation of 4,830 students and 326 teachers from 238 schools across seven Middle Eastern countries. “The calibre of companies that presented this year has been truly inspiring. Our hope is that Taqaddam students will find themselves working within and contributing to such companies in the near future. We want the skills and experience they’ve acquired through our programme to help them succeed across various workplaces and beyond,” said Sabrin Rahman, HSBC’s head of Corporate Sustainability for the Middle East region. Gail Campbell, British Council director Education, Mena said: “We are honoured to receive an International Business Excellence Award for Taqaddam, especially given the high level of competition in our CSR category. Our success is testament to the team of students, teachers and volunteers who all inspire change through skills-based education in their communities.